The cuisine of India is characterized mainly by its rich and spicy dishes. Although vegetarian cuisine is immensely popular in India and you will find a wide variety of rice, vegetable and lentil dishes; meat eaters are also catered for. The cow is a sacred animal in the country, so in India chicken, turkey and lamb are commonly consumed meats. The traditional way is to eat with the right hand, scooping up the food with bread although today, in many tourist restaurants, you can find cutlery. Here you will find the list of typical dishes of India that you can not miss on your holidays to India. 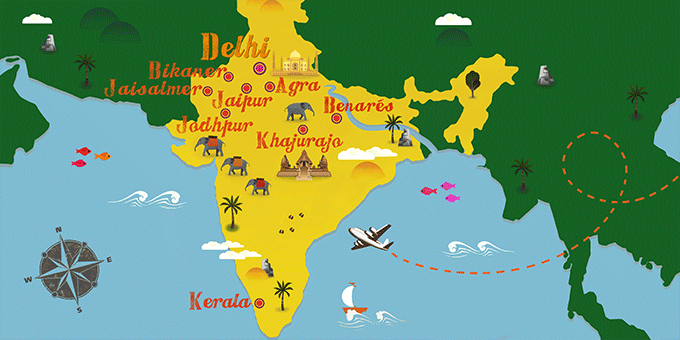 If India has caught your attention, leave us your number so we can call you to discuss the voyage that awaits you.